The Roccbox portable stone bake oven is doing very well on Indiegogo. The retro-looking cooker of pizzas has (at the time of writing) already smashed its flexible $100,000 goal with almost $300,000 of backing. Which isn't bad when you consider it's still got a month left on its crowdfunding campaign. Better yet, it can stone back said Italian food staple within 90 seconds. Yup, you read that right - actual stone baked pizza goodness in less than two minutes. Mmmm, we can almost taste it now. 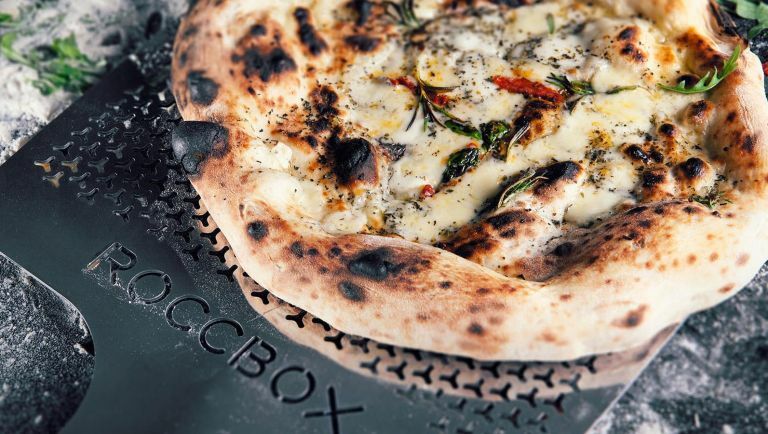 The Roccbox uses heats as high as 499 degrees centigrade to get your portable meal cooked in time and you can swap out its regular fuel for wood if you want to give your culinary creations that extra smokey finish. With the campaign already a success, the creators say the funds will go towards the manufacturing of the Roccbox's first batch, with an aim to ship units out to backers by June this year. You can secure a Roccbox for your next garden BBQ/camping expedition for $429 (£304) right now on the campaign's Indiegogo page (which we're told is a good 25% off the planned retail price, so savings!). The Roccbox is the first portable stone baking oven we've seen (the Unni 2S offers a similar cook time but isn't quite as portable as this one), but still, if homemade pizza on the go is your thing, then give this one a gander.